The project provides a system that allows user to operate the railway level crossing gate through sms sent by operator/incharge. The operation of the railway level crossing is usually operated manually or through wired electronic media. A person needs to be present to operate it from the control room by pulling a lever or button. The system allows operation of railway level crossing through SMS thus allowing user to operate it from any range, anywhere in the world. Operator may open and close railway crossing gate from any where through a simple sms. 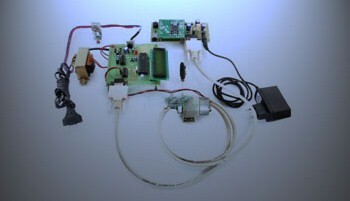 This functionality is achieved through a Gsm modem interfaced to the System that reads the sms commands from user. Suppose if the operator sends a close message it is recognized by the modem and instructs the motor to close the gate. In order to open, the operator sends an open command, this command is received by the modem. On reading it, the gsm modem passes this to the 8051 microcontroller which in turn instructs the motor driver IC to operate motors for specific command. Also the gate status is displayed on an LCD displays as opened or closed.